I have exciting news to share with all my jewelry lovers! HTY Jewelry has made it to the finalist of Indy Week 2019 Best of Triangle - Best Jewelry Store in Wake County. Thank you so much for your support and I just need your help one more time: from now until May 5th please cast your vote for HTY Jewelry so I can win 2019 Best of Triangle - Best Jewelry Store in Wake County this year! Thank you so much!!! 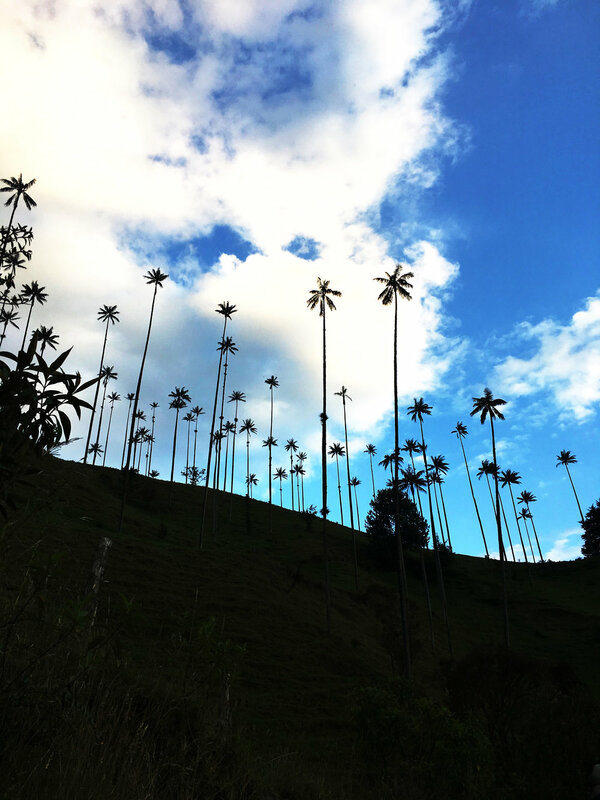 I’m taking a break from talking about jewelry this month but to tell you about my trip to Colombia! You might not know this, but the inspiration that I got from traveling have played a huge role in my jewelry making resource book. 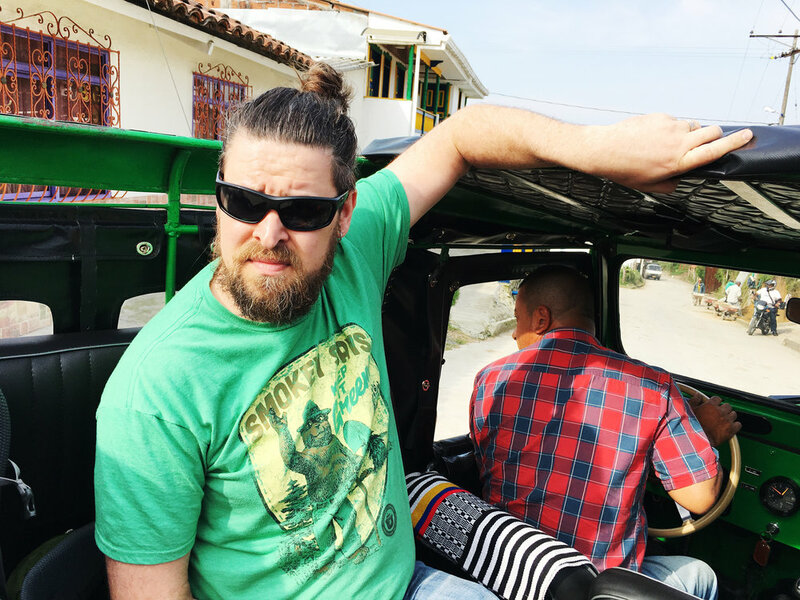 In order to do something special and unforgettable for my hubby, Nate’s 40th birthday last month, we decided to take a nine-day trip to Colombia. 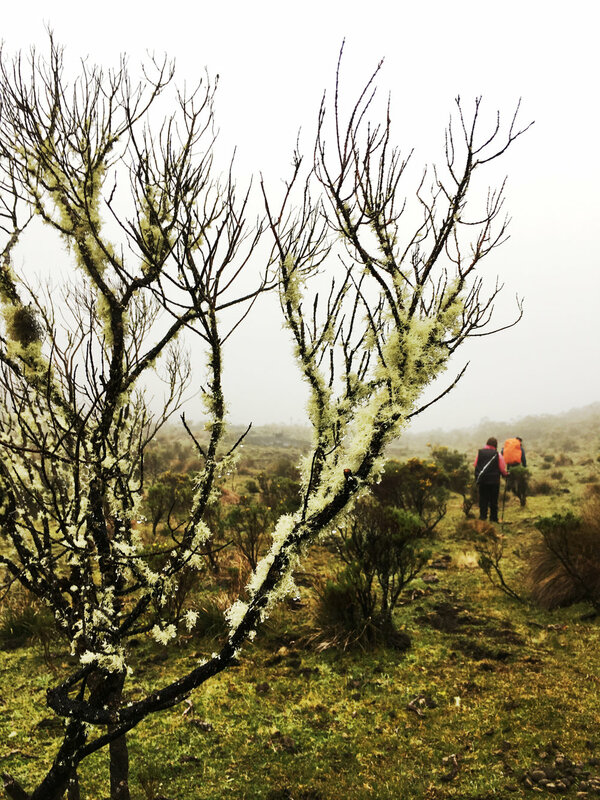 We spent four days in the country’s capital, Bogota, and three days strenuously hiking a trail in Los Nevados National Park. 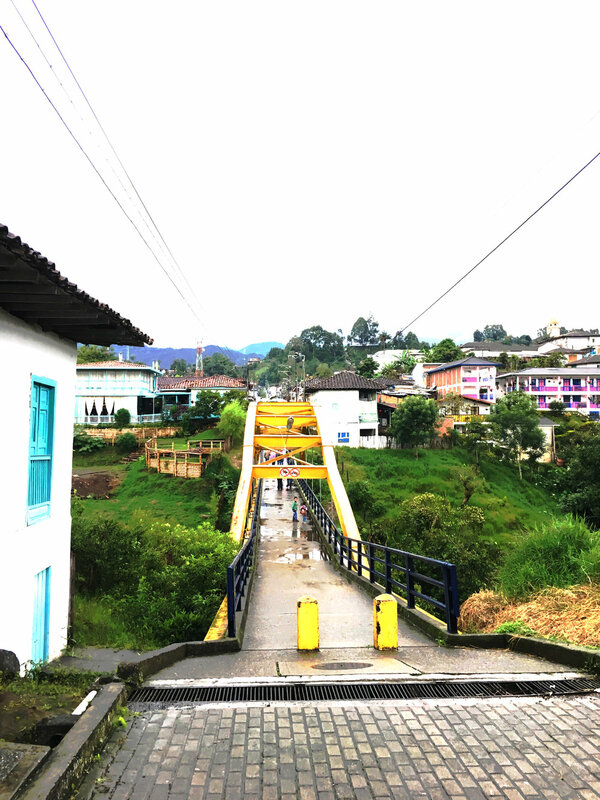 It is located outside of Salento, one of the most famous coffee origins in Colombia. So, why did we choose Colombia? This might sound tacky, but we were actually inspired by watching the Netflix hit show “Narcos.” But it wasn’t the notorious drug cartels or the cocaine industry were attracted to! It was the rich and enchanting culture and gorgeous natural beauty that we saw on the TV show. 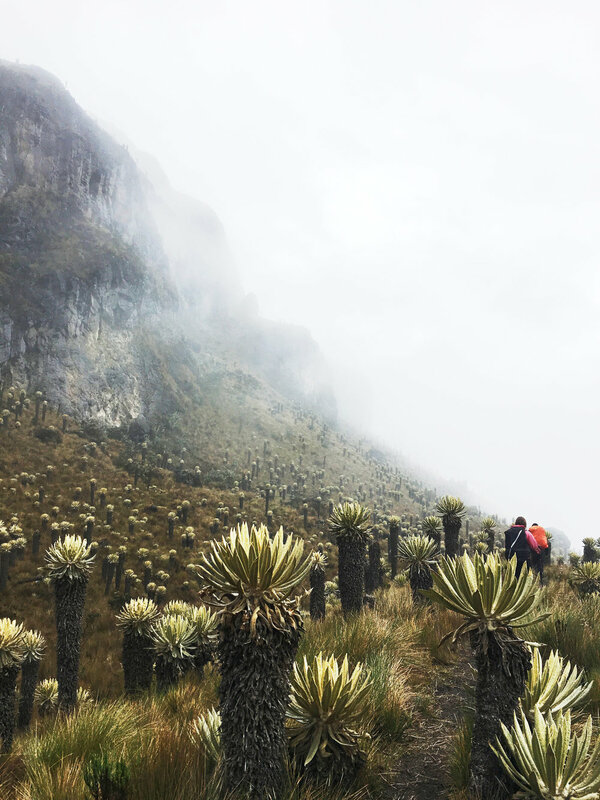 We were a bit concerned about the safety of traveling in Colombia at the beginning, but after reading travel blogs we were confident to book the trip without hesitation. Our trip proved that we made the right decision! The country has tried so hard to change its reputation to the world, and honestly, we felt a lot more safe in Bogota and Salenta than in a lot of major cities in the U.S. And during our entire stay the people are so welcoming and friendly. 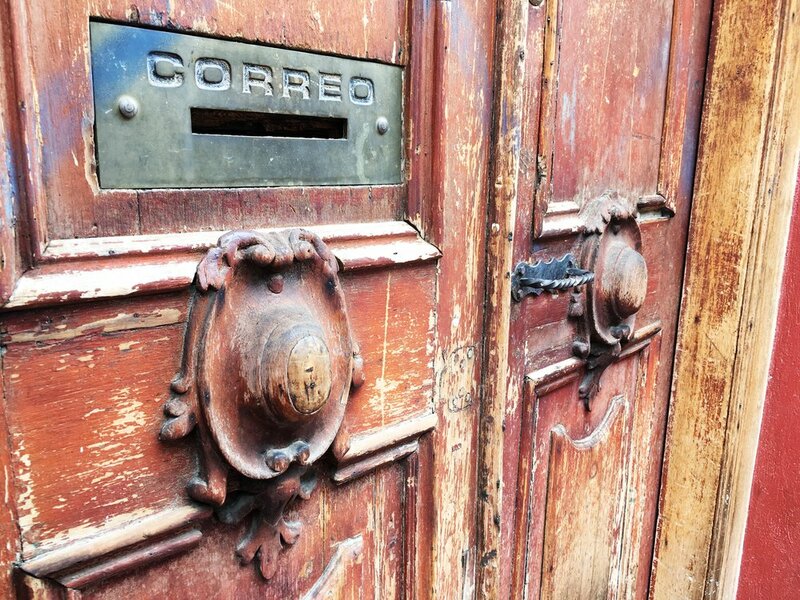 We stayed at the historic area of “La Candelaria” in the heart of downtown Bogota. It’s in walking distance to all the major attractions such as Museo del Oro, or the Gold Museum, Plaza del Bolivar, Fernando Botero Museum, and Monserrate, a mountain 10,341 ft above the sea level. Our Airbnb was located on the very top of the hill in La Candelaria- it sure was a hike especially the city itself is 8000 ft above sea level. There were six fully-armed military soldiers guarding both corner of the street all day and night- it was a bit of cultural shock at the beginning but we agreed that it made our Airbnb to be one of the safest places in all of Bogota. Pretty soon we got used to seeing armed military soldiers and police officers with a K-9 unit everywhere we went. The city of Bogota is very pedestrian-friendly, most of the streets have pavement for pedestrians and some of them even go through city parks so you can avoid the car exhaust and enjoy the walk, we were able to walk to most of the attractions without any navigational issues. 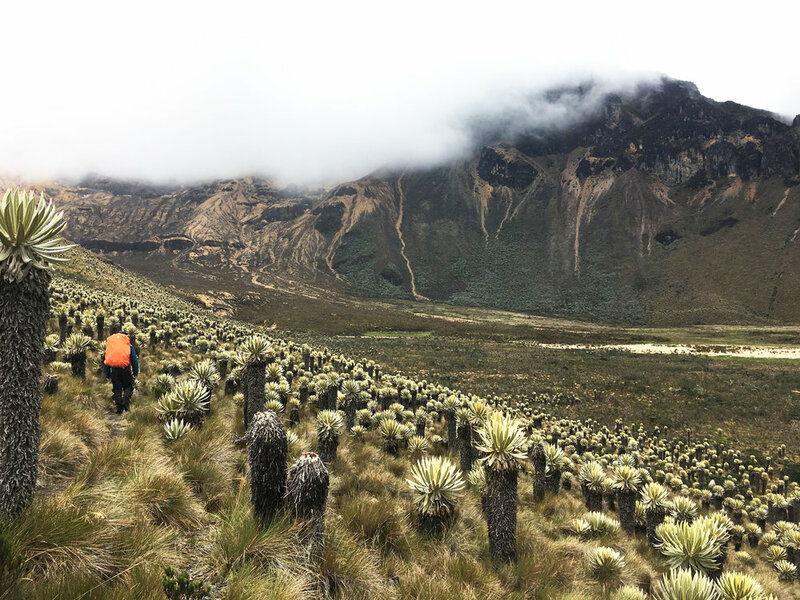 Part 2 of our trip involved a three days and two nights trekking in the Los Nevados National Park just outside of Salento. The original plan was to celebrate Nate’s 40th birthday on the top of Paramillo del Quindío Summit (15,583ft.) on the second day of the trek. Unfortunately, Nate had to return to base camp due to altitude sickness and stomach flu on day one, but he insisted that I should continue the trek for both of us. We said goodbye after lunch and he went back to Salento with another guide. I feel sad that he couldn’t make it through the whole trip, but I’m glad I was able to finish the trek. It was definitely the most difficult hike I’ve ever done. The elevation gain was intense: from 7,800ft to 12,500ft on day one; 12,500ft to 15,000ft on day two, and on the return to Salento we hiked from 12,500ft to 7,800ft. Not only we had to carry a full-size backpack but the extremely high altitude also slowed us down during the incline. Most of the trails were destroyed by mules over the years so it was very muddy and we spent so much time and energy focusing on the trail so we wouldn’t slip. We were exhausted from pulling our feet out of the mud during every step. We were so late on the first day due to the weather and had to hike downhill in the pitch dark muddy trail for two hours. I also almost got run over by an angry cow that we encountered in the middle of the trail. By the time we made it to the base camp every one of my muscles were cramping- I even experienced tricep and waist cramping the first time! I couldn’t even take my shoes off because my leg cramps were so bad that I couldn’t bend over. I will never forget the taste of “Agua panela - sugarcane water,” when one of the guides handed it to me when we arrived to the base on the return. I got hooked on this magical popular Colombian drink right away because it immediately comforted my borderline hypothermia body and exhausted spirit. Day 2 was way much more enjoyable with better weather and breathtaking view, the Paramo ecosystem has the most bizarre landscapes and plants, we were surrounded in a wonderland that’s something you will only see in movies like “Harry Potter” or “Lord of the Rings”. Although we couldn’t make it to the Paramillo del Quindío Summit, 15.583ft, we decided to return at the ridge of 15000ft due to bad weather conditions. We had to cross this spongy marshland where we had to be careful with every step to avoid getting stuck in the soft landing. We literally were jumping like Super Mario except that if we missed we wouldn’t have a second chance if we fell in. We enjoyed the beautiful sunset on the way back and made it back to the base camp’s farm just in-time before dark. Last day was mostly downhill, we stopped by two farms with gorgeous gorge views for breaks and snacks on the way down to Salento. It’s hard to imagine the self-sufficient lifestyle of these farmers as they live the most humble way you can imagine. Their lives are heavily dependent on their mules that carry daily supplies to commute. There are no powerline or water lines connected to their farms so they have to rely on solar power and generators for energy. For water they all have above ground water tower to collect rainwater for their daily water usage. 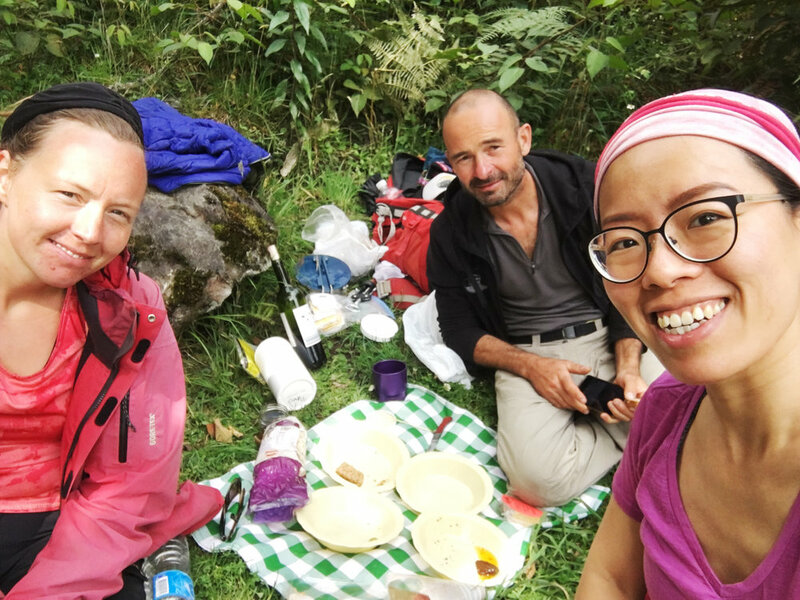 Our guide, Manolo, an Italian expat, outdid himself during this trek by presenting us with an authentic Italian-style lunch picnic which included olives, sun-dried tomatoes, salami, fresh bread, fresh cheese, and A BOTTLE OF WINE!!! We couldn’t believe he carried all this weight over the past three days. His backpack weighed roughly 50lb and he was about 5’ 6”. To show our appreciation, we ate all the food and wine so he can carry less weight on the way back. Getting a bit tipsy definitely helped with going downhill, I felt my legs were a bit lighter, and the pace was a bit faster than usual, and my knees hurt a bit less. We ended our trip by celebrating at a local restaurant, Macaw, located in downtown Salento. Nate joined us and we celebrated his birthday together to makeup for his sad birthday that he spent in the hostel as he was too sick to do anything else. 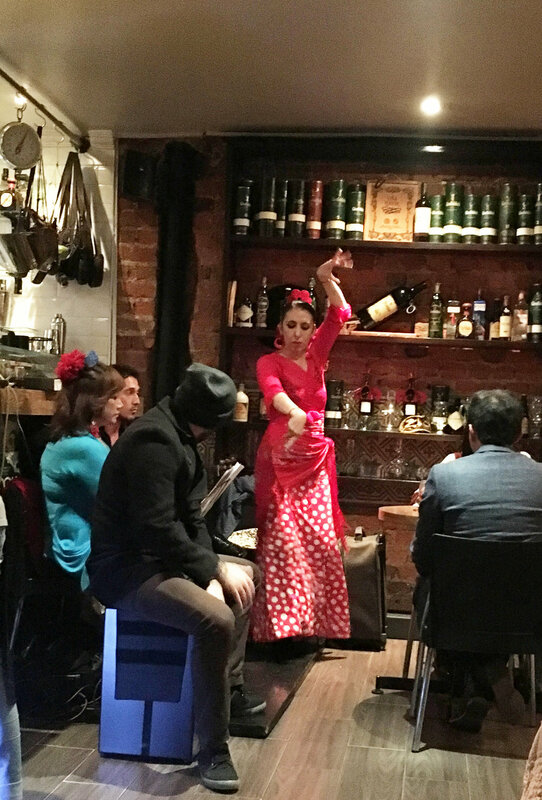 To wrap up our trip to Colombia we spent our last night in a hip Bogota neighborhood at a tapas restaurant with a live Flamenco dance performance. I can’t think of a better way to wrap up our trip. Colombia has so much to offer, we will definitely come back one day to explore more of this beautiful country! Want to experience a high-end handmade craft shopping experience? The 54th Annual Craft + Design show in Richmond is the perfect destination! Craft + Design is a museum-quality show that has garnered a reputation for showcasing the finest in contemporary craft. Shoppers spend the weekend browsing the work of over 150 artists from across the country. Awards are presented in ceramics, precious metals, glass, wood and recycled materials, contemporary design, innovative use of traditional craft materials and fiber. If you are planning on a winter weekend getaway to Asheville on December 1st and 2nd, don’t forget to put The Big Crafty on your must-visit list! Voted Western NC’s favorite art event for nearly a decade, The Big Crafty celebrates the beauty of a human-scale economy and community-building, soul-enriching creative work. It features the work of 150 carefully-selected artists, makers and crafters who embody the dynamism of the independent creative community. A super hip pop-up craft market hosted by my favorite brewery, Trophy on Maywood, and near home? I can’t find a reason to say no to this awesome combination! This year, more than ever, it is important to shop locally for your holiday gifts. Our state’s economy has been hit hard by hurricanes and tropical storms, especially on the coast . I am grateful that Raleigh was not affected to that degree this year. Spending your money locally – whether it’s a coffee shop, hardware store, or a local artist, it all helps to keep your money in our community and in our state. Wishing you peace, love, and laughter this Holiday Season! Who doesn’t love a beautiful fall wedding in the mountains? As fearless millennials, last month my hubby and I went to a family friend’s wedding in Black Mountain, North Carolina, despite the fast-approaching Hurricane Florence. The wedding was held at a charming family farm. The reception was in a rustic barn located near Lake Eden, surrounded by the gorgeous North Carolina Blue Ridge Mountains. With the cooperation of the weather, we had a wonderful time with our friends and the other guests. It was a truly authentic North Carolinian-styled wedding with cheerful bluegrass music and delicious, mouthwatering BBQ. The best part is, I was so honored to custom-design this lovely couple’s engagement ring, matching wedding bands, and even a bridal pendant. It’s not very often that I get to go to my clients’ weddings, you know? But on this night I saw my designs come to life as the bride and groom as they enjoyed their first day as husband and wife. 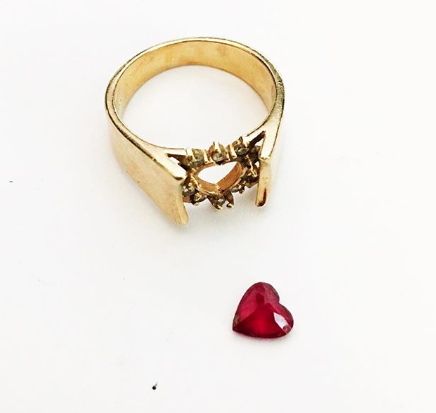 Originally, the bride wanted to use the center diamond from her grandmother’s engagement ring for her engagement ring, but the diamond was severely damaged. I did not recommend repurposing it for the ring. Therefore, I helped her select a one-of-a-kind teal blue (her favorite color) Montana sapphire as the center stone. The neat part about this sapphire is that it changes color from blue to teal to green depending on the movement and lighting. Since the bride is a natural lover, the design is inspired by nature with leaves and flower petals motifs. The couple loves nature and the outdoors and the groom is a carpenter. So, they wanted wood grain textures on their wedding bands. It was a lot of fun figuring out how to scale down and create a realistic wood grain texture on a ring. I ended up spending so much time staring at my hardwood floor when I was carving the ring just so I can get inspired! Then, I repurposed the bride’s heirloom accent diamonds for her band and heirloom sapphire for his band. Since it’s a no-no to repurpose the damaged center diamond for her engagement ring, I suggested that we use it for a pendant instead. 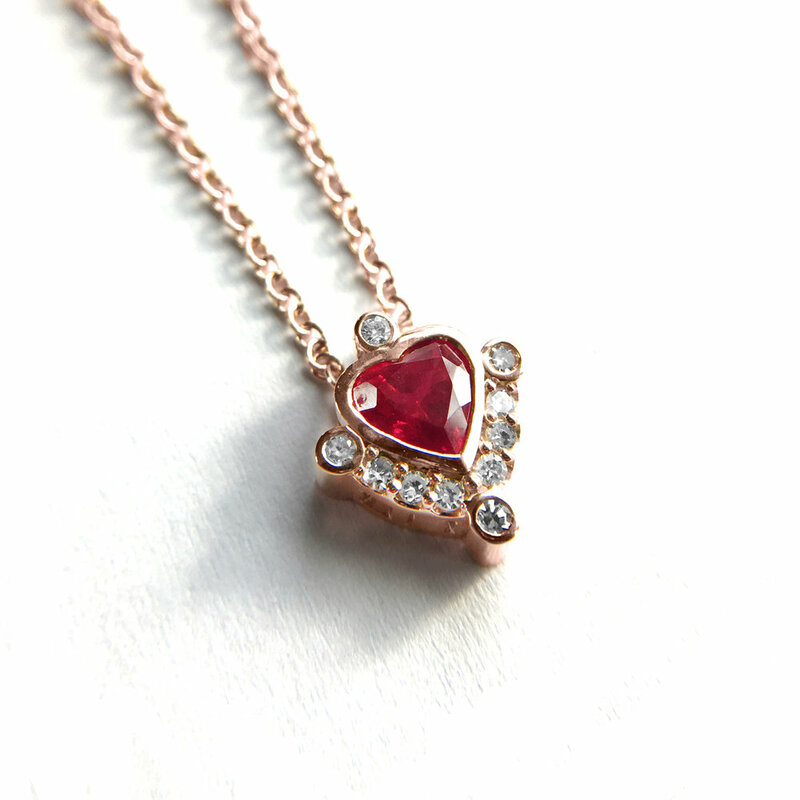 Pendants experience minimum wear and tear for daily wear. 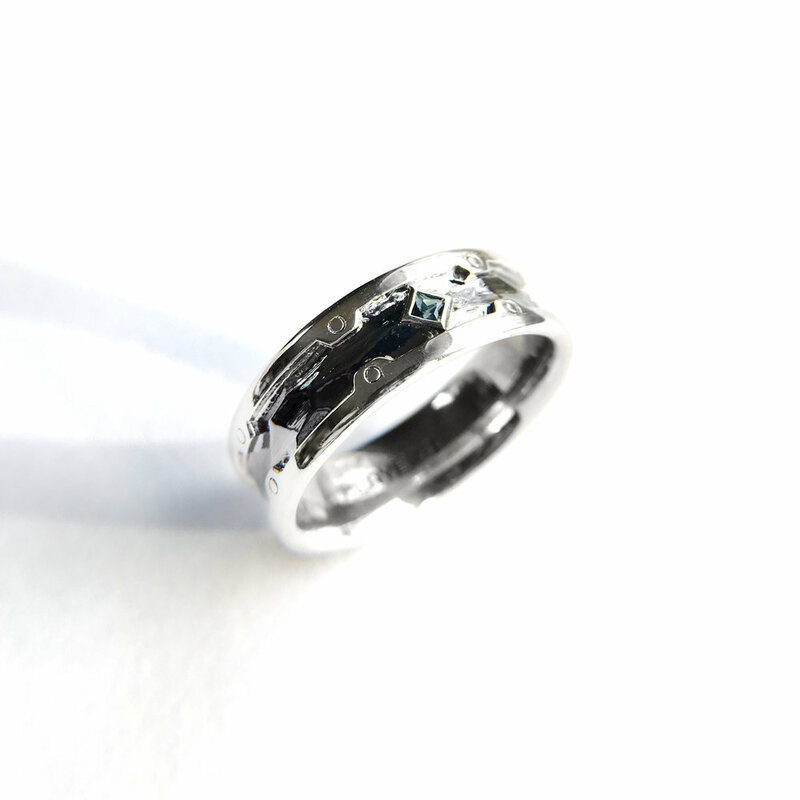 Thanks to the groom ‘s background in industrial design, he suggested that we combine the damaged diamond from her grandmother’s ring and the remaining three sapphires from her grandfather’s ring and turn them into a very modern and chic pendant. It’s great for everyday wear and it fits her lifestyle perfectly. And voila! It’s like solving a puzzle, everything just fell into right place once we started the process. It’s all about deconstruction and reconstruction. Thankfully, everyone is happy with the results! Many congrats to B & C!!! P.S. We made it home safely right before the storm hit Black Mountain (almost got hit by a falling tree limb in Black Mountain, but we dodged it right in time), and our home in Raleigh was spared from any storm damage! #1. 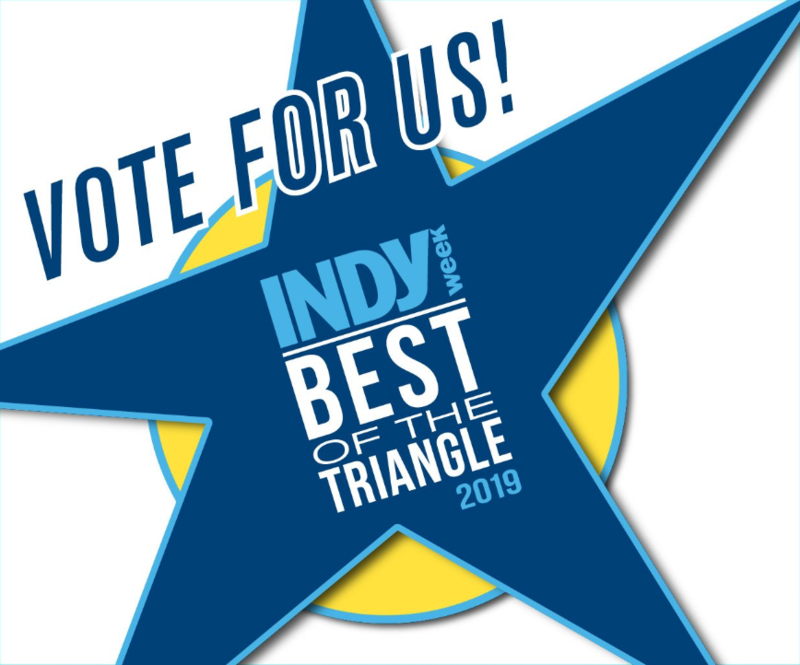 Indy Week Best of the Triangle 2018….Guess what? HTY Jewelry is a finalist! HTY Jewelry is a Best of the Triangle 2018 finalist for “Best Jewelry Store in Wake County.” As a small business owner this recognition means so much to me and my brand, which I have been building since 2013. Please take a minute to cast your vote for me to show your support, thank you so much!!! I'm offering a special one-day electroforming workshop as a double fundraiser in order to benefit Make-A-Wish Foundation and the Town of Cary Scholarship Program. 100% of your tuition goes to both organizations, and I'm donating my time, knowledge, equipment, and supplies for the workshop. It’s a win-win! Not only you will come home with some beautiful jewelry but you are also supporting these two great causes, please call Cary Arts Center at 919-469-4069 or visit the center to register for the workshop. Please let me know if you have any questions. Thank you! What is electroforming? You can explore the endless possibilities that copper electroforming has to offer in jewelry design. Electroforming is the intricate process of fusing copper onto another medium via a low voltage charge that is passed through the materials to create a relief that becomes a separate part in its own right. 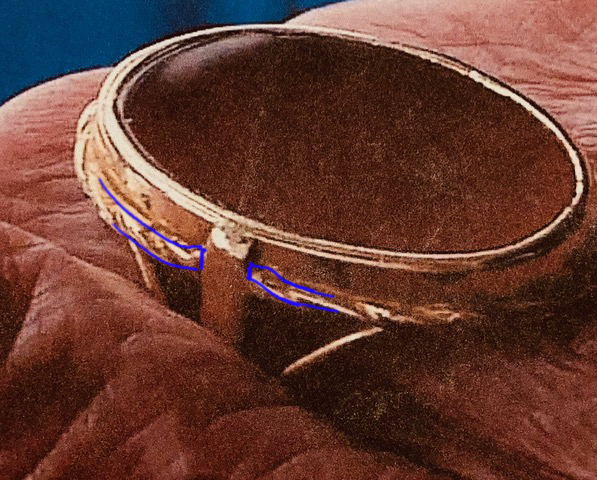 This technique enables artists to create thicker copper structures layered over other materials like glass, shells, clay or wax. This form, unlike electroplating, creates a totally new layer and is actually a science, a method that reflects the best copper use in art. Thomas Edison used electroforming in his work, as did Michael Faraday, a famous 19th Century physicist and chemist. 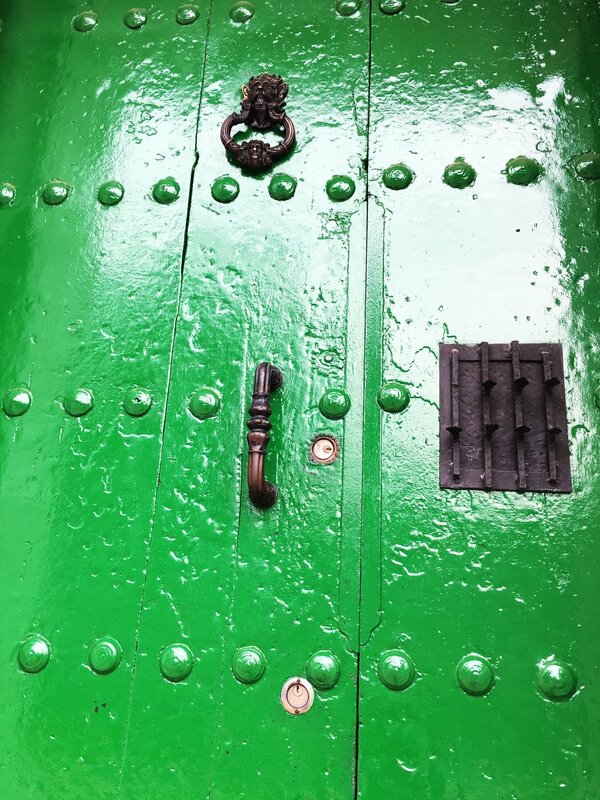 It was exotic, it was costly, and in the early days, was used to reproduce art pieces. 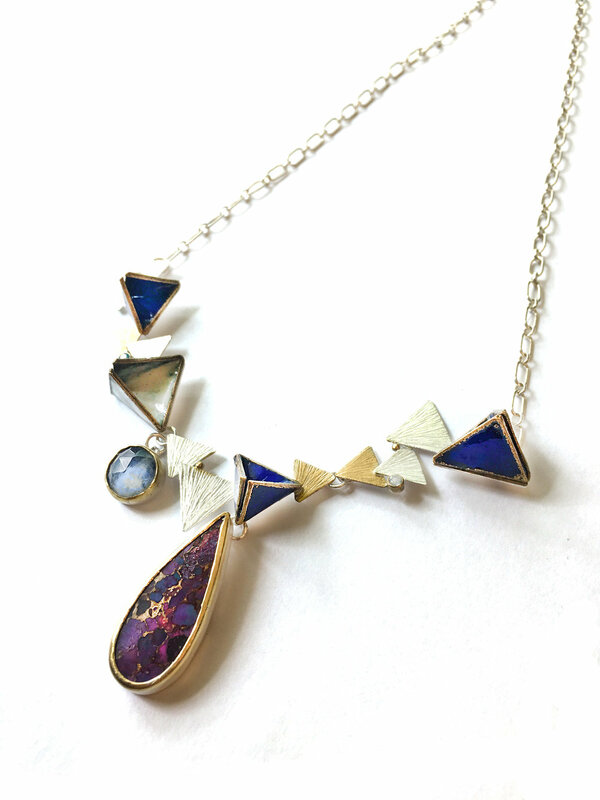 During this workshop with me, gain insight into the creative process involved in electroforming various organic and non-organic objects to create beautiful and unique jewelry. In an effort to raise funds to grant more wishes and in the honor of my cousin, I am combining my love of physical fitness with an amazing cause where I know the money will make dreams comes true. I am participating in the Make-A-Wish Trailblaze Challenge this spring. On Saturday, June 2, I will hike 26.5 miles of the Sauratown Trail with my team of 4 and many others. And here are two ways you can help Make-A-Wish® to grant more wishes! Raffle drawing is scheduled for Wednesday, April 4, 2018 at 10:00 AM Eastern time, the winner will be notified via phone or email and it will also be announced on social media. P.S. Your donation is 100% tax deductible!